The Saleen S7 is an American hand-built, high-performance supercar designed and built by Saleen Automotive Inc. Developed jointly by Steve Saleen for the initial concept, direction and engine, Hidden Creek Industries for resources and initial funding, Ray Mallock Ltd. (RML) for chassis, suspension and aerodynamics, and Phil Frank for the body and interior CAD design and development, it was the first fully proprietary car produced by Saleen and became America's third mid-engine production supercar coming after the Vector W8 and M12. The S7 debuted on August 19, 2000 at the Monterey Historic Races. The all-aluminium engine is a bored-and-stroked derivative of Ford's 351 Windsor small block with Cleveland-style canted valve heads, not based on the FE big-block. It proved remarkably tractable and flexible for such a high-output unit—550 hp (410 kW) at 6400 rpm. In 2005, the S7 gained a more powerful twin-turbo powerplant which boosted engine power to 750 hp (559 kW) and top speed to 248 mph (399 km/h). A silver 2004 model year car appeared in the film Bruce Almighty. The body of the car, made entirely from carbon fiber, incorporates the use of scoops, spoilers, and other aerodynamic features to create Split Channel airflow throughout the car, and at 160 mph (257 km/h), the car creates its own weight in downforce. The interior of the Saleen S7 was designed to be both luxurious and functional. Leather appears throughout the cabin, with aluminum accents, and the S7 comes with a set of custom-fit luggage. Because of the car's mid-engine layout, it has two trunks, front and rear. Other features include an LCD monitor, rear-view camera, quick-release steering wheel and a 240 mph (390 km/h) speedometer. The cabin is of an asymmetrical layout, with the custom-fitted driver's seat positioned toward the center both to improve the driver's visibility and center his or her weight in the vehicle. The chassis uses a space frame-derived design consisting of 4130 lightweight steel and aluminium honeycomb composite reinforcing panels. It is divided into bolt-fastened sub-assemblies to allow for rapid access to critical subsystems. This design contributes to the car's light weight of 2,865 lb (1,300 kg). The naturally aspirated version of the S7 can accelerate from 0–60 mph (97 km/h) in an estimated 3.3 seconds, and to 100 mph (161 km/h) in an estimated 7.1 seconds. It completes a standing 1⁄4 mile (402 m) in an estimated 11.35 seconds, reaching 128 mph (206 km/h). Top speed is an estimated 220 mph (354 km/h). The first few production Saleen S7 electrical systems were designed and hand-built by Jimmy Rodriguez. Standard electronics include: Power windows, power door locks, remote control operated doors, hood, trunk, and engine compartment openers, electronic power steering with redundant safety circuits, 110 volt inlet for maintaining vehicle battery, electronic heated front window, electronic fuel pump shut off upon crash impact, rearview camera system with in-dash flip-up monitor and navigation. Electrical wire harnesses were said to be manufactured with the "highest quality materials." Teflon-coated tinned military specification wire, cannon plugs, gold plated pins and sockets were used for the connectors, and wire harnesses were wrapped with a high-temperature glass mesh under a woven Kevlar outer skin. The Saleen S7 Twin Turbo is an updated version of the original S7. Although the initial concept for the S7 incorporated twin-turbochargers, they were not used on the production car. The engine is upgraded with Garrett twin-turbochargers producing 5.5 psi (0.38 bar) of boost, increasing the maximum power to 750 hp (559 kW; 760 PS) at 6,300 rpm and the maximum torque to 700 lb⋅ft (949 N⋅m) at 4,800 rpm. The front and rear diffusers and the rear spoiler were also reworked to increase downforce by 60%. In 2006, Saleen offered an optional competition package for the S7 Twin Turbo. The package offers a 33% increase in power, to a total of approximately 1,000 hp (1,014 PS; 746 kW), as well as changes to the suspension, a revised front and rear diffuser, and an optional aerodynamic package with carbon fiber front and rear spoilers. The Saleen S7R is a racing version of the standard, naturally aspirated S7, produced from 2000 to 2007. It was designed to compete in grand tourer–style motorsports series and events such as the American Le Mans Series, FIA GT Championship, and 24 Hours of Le Mans. Ray Mallock Ltd. (RML) assembled the first few S7-Rs under the supervision of Saleen's engineering team in their workshops in Britain, before Saleen assumed all S7-R assembly with the French Oreca squad executing final outfitting in 2006. A total of fourteen S7Rs were completed to race-ready condition. Seven additional S7Rs were assembled to a level of completeness requiring the assignment of Vehicle Identification Numbers; however, these chassis were never outfitted into complete vehicles. The first S7-R assembled by RML was completed in late 2000, then immediately shipped to the United States to make its debut in the American Le Mans Series event at Laguna Seca Raceway. Run by Saleen-Allen Speedlab, the car finished in 26th place. For 2001, the first customer chassis would be completed, and their respective teams would enter various championships: Fordahl Motorsports ran in the Grand American Road Racing Championship, RML ran the European Le Mans Series, and Konrad Motorsport ran both ALMS and ELMS. This car with chassis number 001 was named Christine by Saleen engineers. The S7-R quickly showed its capabilities, when Konrad finished in sixth place at the 12 Hours of Sebring, earning their first class victory. Fordahl won seven Grand American events en route to finishing second in the class championship, while RML won four ELMS events and won that championship by a mere point over the Konrad Saleens. Saleen-Allen Speedlab also earned a podium finish at the 24 Hours of Le Mans with an 18th-place finish overall. For 2002, Konrad Motorsport concentrated mostly on the American Le Mans Series (the ELMS having been dissolved following 2001), while Park Place Racing took over Fordahl's entry in Grand American. Newcomer Graham Nash Motorsport won both the British GT and Spanish GT Championships. Park Place won four races and earned their first championship title, while Graham Nash won nine British GT and four Spanish GT races, earning them the title in both series. Konrad Motorsport however struggled against the faster, higher-budget Corvette Racing team and could not score any victories, but were able to finish second in the championship. Konrad Motorsport chose to move their Saleen squad to Europe in order to compete in the FIA GT Championship in 2003, leaving North America without a full-season competitor for the S7-R as Park Place abandoned the Grand American championship. Graham Nash joined Konrad in FIA GT, earning a sixth-place finish in the championship. For 2004, Saleen would have a resurgence of teams as RML returned to run FIA GT, Dominique Dupuy's DDO team entered the FFSA GT Championship, Konrad assisted the new Vitaphone Racing, and ACEMCO Motorsports purchased two brand-new S7-Rs, modified to better compete in the American Le Mans Series. Vitaphone earned three victories in FIA GT en route to a fourth place in the championship, while DDO earned two victories in FFSA GT. Fortunes would quickly turn for the S7-Rs in the 2005 season. Konrad and Graham Nash saw their racing efforts downsized as the teams hit economic problems. Vitaphone Racing moved on from the S7-R and raced a Maserati MC12 to the FIA GT championship. This left ACEMCO to take second in the American Le Mans Series, while DDO earned the only Saleen wins that year with three. In an attempt to rebound from 2005, Saleen chose to concentrate on select series and events. ACEMCO dropped out from the American Le Mans Series in order to concentrate solely on entering the 2006 24 Hours of Le Mans where they earned an 11th-place finish, the best ever by a Saleen at the time. Oreca was chosen to prepare new S7-R chassis with upgrades under the supervision of Saleen engineers William Tally, Derk Hartland, Randall Speir, Matthew W. Wright and William Kreig to make them more competitive, which led to the team earning two victories in the Le Mans Series and winning the 2006 FFSA GT Championship. In FIA GT, Zakspeed took over as the factory squad with Balfe Racing running as a privateer. Zakspeed managed to earn two victories and earn themselves fourth in the championship. For 2007, Zakspeed was forced to abandon their FIA GT effort as the team went bankrupt during the off-season. ACEMCO also was forced to withdraw and offer their S7-Rs for sale. Oreca finish-assembled two more chassis using subassemblies provided by Saleen, with one going to the Italian Racing Box squad who would compete alongside Oreca in the Le Mans Series. Oreca won four races during the season. In 2010, the Oreca finish-assembled S7-R (chassis number 610) of Larbre Compétition won the final and its only LMGT1 class victory at the 24 Hours of Le Mans. Initial fabrication and assembly of this chassis was performed by Saleen's Irvine, CA engineering team in 2006-2007 after normal business hours due to a shortage of funding. Subsequently, Saleen engineers named the car Melissa, after the girlfriend of one of the Saleen race engineers. The ACEMCO Motorsports S7-R the 2005 Petit Le Mans. Graham Nash Motorsport's S7-R at the 2005 1000 km of Spa. Zakspeed's S7-R in the FIA GT Championship's 2006 Oschersleben 500 km. "2001 Saleen S7 Introduction". The Auto Channel. Retrieved 2007-05-05. "2006 Saleen S7 Specifications". Saleen, Incorporated. Retrieved 2007-05-05. ^ a b "Concept Carz: 2001 Saleen S7". Concept Carz. Retrieved 2007-05-05. ^ Lamm, John (2006). Velocity: Supercar Revolution. MotorBooks. pp. 236–237. ISBN 0-7603-2596-0. ^ Robson, Graham. The Illustrated Directory of Sports Cars. MotorBooks. pp. 430–433. ISBN 0-7603-1420-9. ^ Wallace A. Wyss (June 2005). "At Ford, a Supercar Delivers a Super Headache". Car and Driver. Archived from the original on 2009-05-25. Retrieved 2007-11-11. ^ a b c "Motor Trend: Saleen S7". Motor Trend. pp. 1–4. Retrieved 2007-06-05. ^ Kim Wolfkill (September 2006). "First Drives - Saleen S7 Twin Turbo". Road & Track. Archived from the original on 2007-03-28. Retrieved 2007-06-06. ^ "Motor Trend: "Bruce Almighty" Saleen S7 on eBay". Motor Trend. 15 August 2003. ^ "Saleen S7 - Road Test - Auto Reviews". Car and Driver. Archived from the original on 2010-08-04. Retrieved 2010-06-13. ^ a b c "Concept Carz: Saleen S7 TT". Concept Carz. Retrieved 2007-05-05. ^ Kenny Jr., David; Walker, Howard; McCann, Elizabeth (2007). "Exotic Car Buyers Guide 2007: Saleen S7 Twin Turbo". Exotic Car Buyers Guide: 121. ^ a b c "Saleen.com: Saleen S7 Twin-Turbo". Saleen.com. Archived from the original on 2007-10-19. Retrieved 2007-10-29. ^ Nick D., ed. (March 25, 2016). "2005 Saleen S7 Twin Turbo". Supercars.net. Retrieved 2007-05-05. ^ a b "Fast-Autos: 2006 Saleen S7 Twin-Turbo Competition". Fast-Autos. Retrieved 2007-06-04. 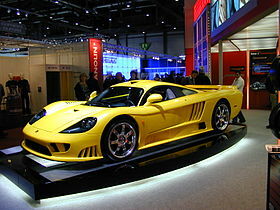 Wikimedia Commons has media related to Saleen S7. This page was last edited on 6 April 2019, at 16:30 (UTC).